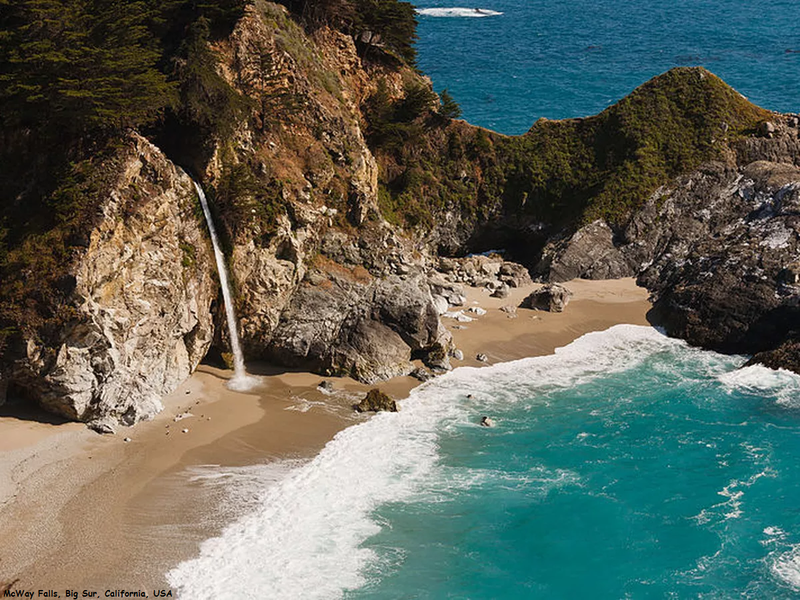 McWay Falls is an 80-foot (24 m) waterfall that flows year-round from McWay Creek in Julia Pfeiffer Burns State Park, about 37 miles (60 km) south of Carmel, California, to the Pacific Ocean. The waterfall is one of two in California that cascade directly into the ocean, the other being Alamere Falls. From the parking lot on Highway 1, visitors walk down a half-mile dirt path toward the ocean, through a short tunnel under the highway to the overlook. The Waterfall Overlook of McWay Falls was built on the site formerly occupied by the Browns' home. Visitors to the site today can view the remnants of the home's foundation, landscaping, including palm trees, and Funicular railway. The Pelton wheel is displayed in a small building.